C T A' S C É S A R E . C H Á V E Z M E M O R I A L E D U C A T I O N A W A R D S P R O G R A M recognizes students and their teachers who demon- strate an understanding of the vision and guiding principles by which César E. Chávez lived his life. Student-created visual arts and written essays are posted online and in various CTA publications. The 2015 winners will be announced prior to César E. Chávez Day, March 31. The state holiday commemorates the life of Chávez, who dedicated his energy to helping improve the plight of the Ameri- can farmworkers and to pointing out the dangers of pesticide use on food. His deep belief in nonviolence and in the teachings of Martin Luther King Jr. won him the admiration and respect of leaders through- out the world. 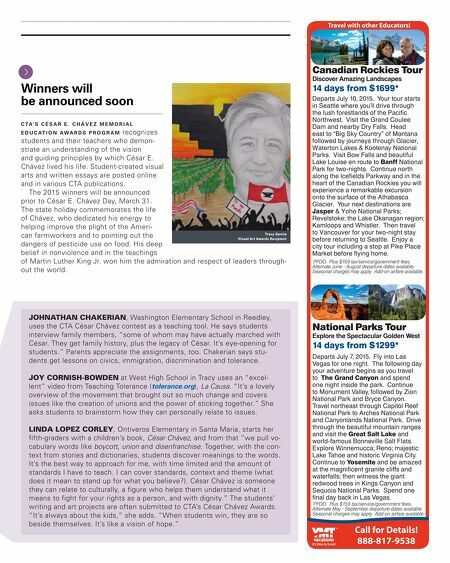 JOHNATHAN CHAKERIAN, Washington Elementary School in Reedley, uses the CTA César Chávez contest as a teaching tool. He says students interview family members, "some of whom may have actually marched with César. They get family history, plus the legacy of César. It's eye-opening for students." Parents appreciate the assignments, too. Chakerian says stu- dents get lessons on civics, immigration, discrimination and tolerance. JOY CORNISH-BOWDEN at West High School in Tracy uses an "excel- lent" video from Teaching Tolerance (tolerance.org), La Causa. "It's a lovely overview of the movement that brought out so much change and covers issues like the creation of unions and the power of sticking together." She asks students to brainstorm how they can personally relate to issues. 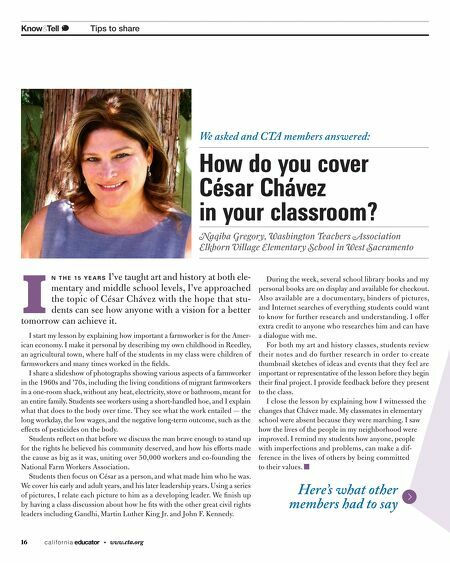 LINDA LOPEZ CORLEY, Ontiveros Elementary in Santa Maria, starts her fifth-graders with a children's book, César Chávez, and from that "we pull vo- cabulary words like boycott, union and disenfranchise. Together, with the con- text from stories and dictionaries, students discover meanings to the words. It's the best way to approach for me, with time limited and the amount of standards I have to teach. I can cover standards, context and theme (what does it mean to stand up for what you believe?). César Chávez is someone they can relate to culturally, a figure who helps them understand what it means to fight for your rights as a person, and with dignity." The students' writing and art projects are often submitted to CTA's César Chávez Awards. "It's always about the kids," she adds. "When students win, they are so beside themselves. It's like a vision of hope." Winners will be announced soon 17 V O L U M E 1 9 I S S U E 6 Travel with other Educators! Call for Details! 888-817-9538 National Parks Tour Explore the Spectacular Golden West 14 days from $1299* Departs July 7, 2015. Fly into Las Vegas for one night. The following day your adventure begins as you travel to The Grand Canyon and spend one night inside the park. Continue to Monument Valley, followed by Zion National Park and Bryce Canyon. Travel northeast through Capitol Reef National Park to Arches National Park and Canyonlands National Park. Drive through the beautiful mountain ranges and visit the Great Salt Lake and world-famous Bonneville Salt Flats. Explore Winnemucca; Reno; majestic Lake Tahoe and historic Virginia City. Continue to Yosemite and be amazed at the magnificent granite cliffs and waterfalls; then witness the giant redwood trees in Kings Canyon and Sequoia National Parks. Spend one final day back in Las Vegas. * PPDO. Plus $159 tax/service/government fees. Alternate May - September departure dates available. Seasonal charges may apply. Add-on airfare available. Canadian Rockies Tour Discover Amazing Landscapes 14 days from $1699* Departs July 10, 2015. Your tour starts in Seattle where you'll drive through the lush forestlands of the Pacific Northwest. Visit the Grand Coulee Dam and nearby Dry Falls. Head east to "Big Sky Country" of Montana followed by journeys through Glacier, Waterton Lakes & Kootenay National Parks. Visit Bow Falls and beautiful Lake Louise en route to Banff National Park for two-nights. Continue north along the Icefields Parkway and in the heart of the Canadian Rockies you will experience a remarkable excursion onto the surface of the Athabasca Glacier. Your next destinations are Jasper & Yoho National Parks; Revelstoke; the Lake Okanagan region; Kamloops and Whistler. Then travel to Vancouver for your two-night stay before returning to Seattle. Enjoy a city tour including a stop at Pike Place Market before flying home. * PPDO. Plus $159 tax/service/government fees. Alternate June - August departure dates available. Seasonal charges may apply. Add-on airfare available.